Garden Egg Sauce may well be the best sauce for Boiled White Yam. It contains palm oil which boiled yam loves. It can also be prepared with vegetable oil but I do not recommend that. Keep reading for details. Always buy baby garden eggs. These are garden eggs that are harvested as soon as they mature. If they over-mature or are even beginning to ripe, the seeds will be very tough and hard for the blender to grind. Even worse if you are using a mortar and pestle. I prefer the white or off-white variety of garden eggs for this recipe. You can also use the green variety. You can use eggplant or aubergine as alternative for garden eggs. In that case, use about 3 for the stated quantities of ingredients. Fry with palm oil if you will use the garden egg sauce for boiled white yam or boiled plantains. Fry with a tasteless and odourless vegetable oil if you will use it to eat boiled white rice or boiled potatoes. In my opinion, this sauce should only be prepared with palm oil because it is more delicious. Palm oil gives the sauce a unique delicious flavour. The palm oil adds colour to this sauce. This means that when you fry with vegetable oil, it does not look as appetizing. Ogiri okpei (iru) is a traditional seasoning made from locust beans. If you do not have it, use stock cubes. Also, when preparing this recipe with vegetable oil, use stock cubes. You should add enough palm oil to fry the garden egg puree. Palm oil is good for you! If you are in Nigeria use a milk cup to measure the palm oil. You can use boiled mackerel if you do not have smoked mackerel but smoked is the way to go. Rinse the garden eggs very well and remove the stalk. Cut the garden eggs into small pieces. Put in a blender and pour just enough water to help the blades of your blender move. Boil some water in a pot. Add the garden eggs and continue to cook till the are soft. Peel the water-proof skin of the garden eggs. Pound in a mortar till a smooth puree is achieved. Put the garden egg pieces in a pot and pour some water to the same level as the contents of the pot. Cook till the pieces are very soft, soft enough to melt when you press with a fork. Keep cooking till almost all the water has dried. Pour into a sieve with a wire mesh or any other rough sieve and mash it up. Cut the onion into small pieces. Pound the pepper and ogiri okpei in a mortar till smooth. Prepare the smoked fish if you don't have some and separate them into small pieces. Start cooking the yam or the staple food you will serve with the garden egg sauce. Pour the garden egg puree into a clean pot and cook till all or almost all the water dries up. Set it aside. Skip this step if you prepared the garden egg puree using step b above. Pour the palm oil into a clean dry pot and heat it up. Do not bleach it, you only need to heat till a piece of onion sizzles when added to the hot oil. When the oil is hot enough, add the onions and fry for about 2 minutes. Add the garden egg puree and stir for a bit. Cover the pot and cook-fry for some time and stir again. Repeat step 4 till the small amount of water in the puree dried up. the paol oil will also be separated from the puree. Add the ogiri okpei and habanero pepper blend then add salt to your taste. Add the smoked fish, stir, cover and leave to simmer and it's done! 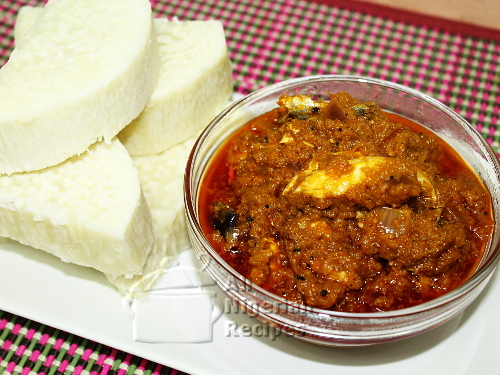 Use the Garden Egg Sauce to eat Boiled White Puna Yam (best combo), Boiled Plantains and Agidi/Eko. If you fried the sauce with vegetable oil, use for Boiled White Rice and Boiled Potatoes.